I've never been a fan of the rain and I think it's because we always get a ton of it in the fall/winter. This is actually my first time shooting in the rain. I figured since the forecast shows rain for the next few weeks, I needed to bite my tongue, figure out my camera, and get out there and shoot. Chase and I found an under cover spot for him to shoot, while I was still able to be out in the open. Luckily, it was only sprinkling that day. If any of you shoot when it's raining, I'd be curious to know what you use to protect your gear? When it's raining I'm all about comfort and most of the time I find myself reaching for a ton of layers to create an effortless cute look. In the fall/winter I typically pull out my beanies a lot because they eliminate the amount of time I spend on my hair. I usually end up quickly curling my hair, which takes no more than 15 minutes. Unfortunately, with the rain my curls usually just turn into waves. To finish off this look I added a pair of folded over cable knit Hunter socks, a black scarf, plaid shirt, grey and white patterned mittens, a bucket bag, and a long hooded cardigan, which you can also see me wearing here. Hope everyone has a great week and thanks so much for stopping by! I don't like rain, either. Fortunately, the rainy days in D.C. stopped and I was able to have my blog photos taken. I love your wintery look! You look so cute in that pretty beanie! Have a great week! Thanks Danielle! I'm such a sucker for beanies. Ah yeah we get way too much rain here and I absolutely hate it. Especially when we have a day of shooting planned. I'm still trying to find some good under cover spots where I don't need to worry about my camera getting soaked. Unfortunately I haven't been able to find any. Only ones that I can still go out when it's just sprinkling. Thanks for stopping by and hope u had an awesome weekend:-). 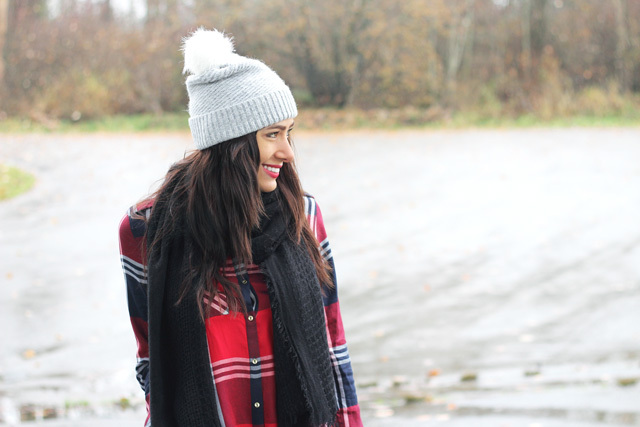 Loving how cozy and warm you look! So very pretty! The pop of plaid addsa nice bit of color to this too. I havent shot in pouring down rain really, but I have in heavy snow falls. For those, I throw a towel over top of the camera while its on the tripod. Thank u Amanda! I definitely love my plaid. That's a great idea, I'll see if that works out for me! Thanks for the tip:-). Ela, I love everything about this look! Your photos came out perfect in the rain, I have to learn my settings, too! You've definitely motivated me to give it a look, you just never know! Anyways, I hope you're having wonderful start to your week so far, beautiful! Thank u Jalisa! I was a little nervous at first given that I've never been shooting in the rain. But they definitely worked a lot better than I thought. Luckily it was only sprinkling that day or else I probably wouldn't be able to bring my camera out or it would get soaked. I just wish I could find a really beautiful indoor location around here to shoot some photos at because it's been pouring lately! Hope u had a lovely weekend! This is too cute of a rainy day look! I love the bright red plaid shirt paired with the neutral leggings and sweater. Great boots too! This is the cutest rainy day look ever! Pinning it now! I feel you! I don't like rain either. However you look incredible! Love this look, so cozy and beautiful. Thanks Raysa! I know it's always such a bummer when it rains! You do this look so well! I never look good in the rain. Your plaid and sweater is really a good combination. You seriously could not be ANY prettier! Love this entire cozy look on you, love! Awe no worries, until I figure things out better with my camera i'll need to start sourcing more under cover areas to go shooting. I agree with overcast weather and how I started to prefer it much more. Especially in the fall/winter it's a lot more difficult to shoot on sunny days because the colour balance is always off. You look so fabulous and cute at the same time, dear. Love your cardigan and the photos are beautiful. Thank you Liza! I was a bit worries that the photos wouldn't turn out with the weather. It has been raining a lot here too, so wells are a staple in my fall/winter routine. Sadly I cant offer any tips on shooting in the rain, I don't do outfit posts, so I get to stay indoors! Thank u so much Rachel! I was a bit worried they wouldn't really turn out, but I'm glad I am made the plunge and went out. Hope u have a great week! What a stylish outfit for a rainy day! I love how you didn't let the weather rain on your "fashion parade"! You look cozy and warm. Very pretty! Hahaha thanks! And me too! I'm really glad I went out there too. You'll never know until u try:-). Hope u have a lovely week Lauren. Thank u so much for stopping by! Your look is so chic and it's perfect for this season! :-) Like it! Absolutely love this fall outfit! Specially how you mixed the red plaid shirt with grey cardigan! very stylish!!! You seriously are so gorgeous and have the BEST style! Even all bundled up you look so chic and fashionable! Each piece elevates the entire look! Just amazing! Thank u so much Molly! Hahaha usually when it's super cold I'm just adding layer after layer LOL. If you're going to get caught in the rain, you might as well look adorable like you. Great plaid shirt. The perfect piece to pair with these neutral tones. Love the look. Thank u Vivian! I don't mind going out when it's sprinkling, but the last few days it has been pouring. Chase and I went on the weekend and it started to pour and we couldn't even take any photos under a covered area we found.. better luck next time! Lol. 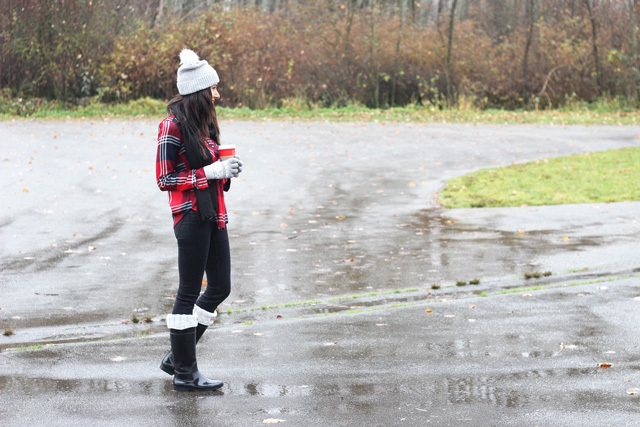 Ella, this look is so beautiful and it was definitely worth shooting in the rain:) I really like the combination of your red plaid shirt, long grey cardigan and a beanie. It's so cozy and chic. To be honest, I never tried taking pictures when it's raining or snowing, because we have quite a lot of dry but cold winter days. Our January and February are probably the coldest months, so I plan to find a nice indoor location to shoot my outfits. Awe thank u Yulia! I was super warm with all my layers, so it wasn't as bad as I thought and the mittens really helped too:-). Yeah u don't really get much rain in Montreal, lucky u! Although I know u get a ton of snow. This time of year it's definitely much harder to go out and shoot with how cold it is. I'm trying to actually find some nice indoor spots too.. haven't had any luck lately! Where are u thinking of shooting? OMG I'M so in love with your look, haven't seen such a cute rainy day look recently. the Beanie looks so pretty on you. Thank you so much Alexa! Super sweet of you to say:-). Hope ur having a great week so far! Thank u so much Joanna! 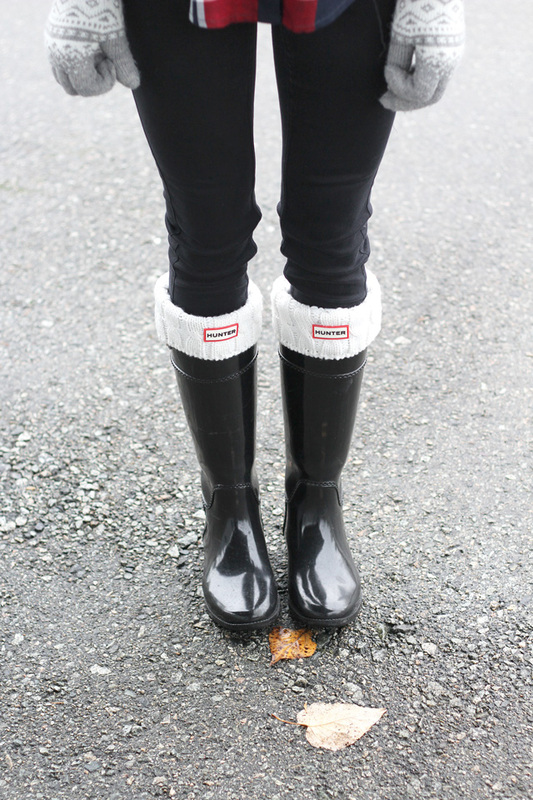 Oh you'll definitely need a cute pair of rain boots to stay nice and dry:-).